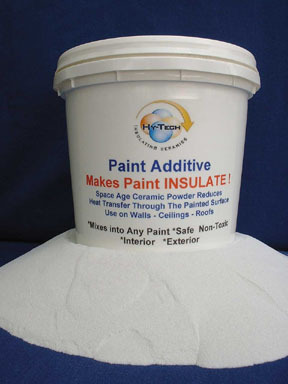 The insulating additive is available as a stand-alone product that can be mixed into store-bought paints, or as a pre-mixed application in a complete line of factory-blended interior, exterior, waterproofing, and roof coatings. Painting the interior or the exterior of a house can be quite an arduous task, but few realize that adding a fresh splash of color to the walls and siding of their homes can lead to reduced energy consumption and substantial savings on utility bills. Hy-Tech Thermal Solutions, LLC, of Melbourne, Florida, is producing a very complex blend of ceramic vacuum-filled refractory products designed to minimize the path of hot air transfer through ceilings, walls, and roofs. The insulating ceramic technology blocks the transfer of heat outward when applied to paint on interior walls and ceilings, and prevents the transfer of heat inward when used to paint exterior walls and roofs, effectively providing year-round comfort in the home. As a manufacturer and marketer of thermal solutions for residential, commercial, and industrial applications, Hy-Tech Thermal Solutions attributes its success to the high performance insulating ceramic microsphere originally developed from NASA thermal research at Ames Research Center. Shaped like a hollow ball so small that it looks as if it is a single grain of flour to the naked eye (slightly thicker than a human hair), the microsphere is noncombustible and fairly chemical-resistant, and has a wall thickness about 1/10 of the sphere diameter, a compressive strength of about 4,000 pounds per square inch, and a softening point of about 1,800 ºC. Hy-Tech Thermal Solutions improved upon these properties by removing all of the gas inside and creating a vacuum. In effect, a mini thermos bottle is produced, acting as a barrier to heat by reflecting it away from the protected surface. When these microspheres are combined with other materials, they enhance the thermal resistance of those materials. In bulk, the tiny ceramic beads have the appearance of a fine talcum powder. Their inert, nontoxic properties allow them to mix easily into any type of paint, coating, adhesive, masonry, or drywall finish. Additionally, their roundness causes them to behave like ball bearings, rolling upon each other, and letting the coatings flow smoothly. When applied like paint to a wall or roof, the microsphere coating shrinks down tight and creates a dense film of the vacuum cells. The resulting ceramic layer improves fire resistance, protects from ultraviolet rays, repels insects such as termites, and shields from the destructive forces of nature. Hy-Tech Thermal Solutions proximity to Kennedy Space Center provides the company with the latest advances in the fields of energy, chemistry, and environmental study. Its president, Al Abruzzese, worked for Lockheed Corporation at the Cape Canaveral Air Station in the late 1960s and early 1970s, as a missile team supervisor on nuclear submarines. This position kept Abruzzese in close contact with the activities at Kennedy. Years later, Abruzzeses work as a painting contractor also kept him apprised of the Centers operations. It was during this time that he was exposed to new technologies such as specialized heat-resistant and corrosion-prevention coating systems. After a decade of facing storm destruction on Santa Rosa Island, Florida, Mark and Valerie Sigler were awarded a Federal Emergency Management Agency grant to build an energy-efficient, super storm-proof structure, utilizing the latest technological innovations. 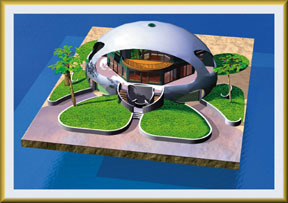 When construction started on the dome home in 2002, the Siglers chose Hy-Tech Thermal Solutions ceramic additives and coatings to maximize energy efficiency. For example, the insulating properties of Space Shuttle tiles immediately came to mind and sparked Abruzzeses interest. He and a coworker asked themselves if it would be possible to incorporate the heat-resistant properties of the ceramic tiles into a commercially available paint product, and thus reduce the thermal transfer of treated surfaces. The challenge was many-sided, but Abruzzese discovered that NASA resources, including the use of NASA and university laboratories, were readily available to permit him to conduct extensive research. He soon began to realize the viability of his idea, and pushed forward to overcome the obstacle of finding just the right combination of materials that would provide adequate coverage, would not be too heavy or delicate, could be sprayed, and would not have an adverse reaction with the paint itself. By fusing NASA research with his own efforts, Abruzzese selected a variety of ceramics from around the world to intermix and create the Hy-Tech Insulating Ceramic Additive he now markets. The Hy-Tech Insulating Ceramic technology is available as a stand-alone product that can be mixed into store-bought paints, or as a pre-mixed application in a complete line of factory-blended interior, exterior, waterproofing, and roof coatings. All products are tested under the harsh conditions of Floridas east coastal region, notorious for its mildew, sulfide gas staining, and hurricane-driven rains. Hy-Tech Thermal Solution paints and coatings can be used to coat steam pipes and fittings, metal buildings (rust prevention), cold storage facilities (walk-in coolers and freezers), delivery trucks, buses, mobile and modular homes, and RVs and campers. Exterior coatings of the ceramic additive have been applied to trailers housing electronics at Federal aviation locations. The coatings reduce temperature, and thereby lessen the load on the air-conditioning systems inside the trailers. They also provide waterproof surfaces that cut down on moisture in the trailers, keeping the electronic components better protected from the environment. Similar coatings are utilized by the U.S. Forestry Service to insulate and coat underground cables and irrigation systems. These applications are especially effective in preventing rodents and other pests from gnawing through the cables and damaging the underground systems, ultimately averting costly repairs. Abruzzese encourages homeowners to utilize ceramic-reinforced coatings on their roofing systems to significantly decrease heat inside the attic and home. According to him, This simple measure can reduce air-conditioning costs significantly. If every home in the United States became just 10 percent more efficient, savings in utility costs would reach into the trillions. He also points out that the Hy-Tech Insulating Ceramics extend the life of a paint coating, and make the painted surface more durable. As NASA engineers work to improve the Space Shuttle tiles, Abruzzese is watching closely to see how new advancements in this area can continue to influence his own field of work.